If you were challenged to hit a quarter (i.e. a 25-cent piece) at 800 yards, how would you respond? Well here’s the story of a man who did take that challenge, and proceeded to put a bullet right through the quarter. 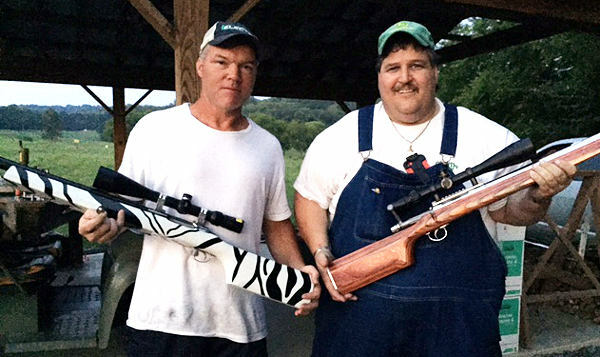 Forum member Randy D., aka “Birdog”, provides this entertaining account of how his friend Junebug drilled a quarter at 800 yards one Tennessee evening…. 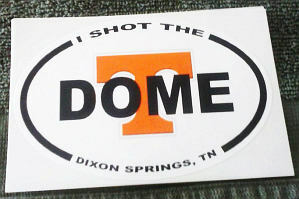 A friend from Indy visited the DOME last summer and returned home telling stories of eggs at 800 yards. He called me back and said his friends did not believe it and wanted to know if I could hit a quarter out at 800 and mail it to him. Well, I had finally got the time for that challenge last Sunday. My friend Junebug came over and I told him about a new challenge. Junebug is sort of like Voldoc and does not like to be told it can’t be done and set his sights on the quarter. 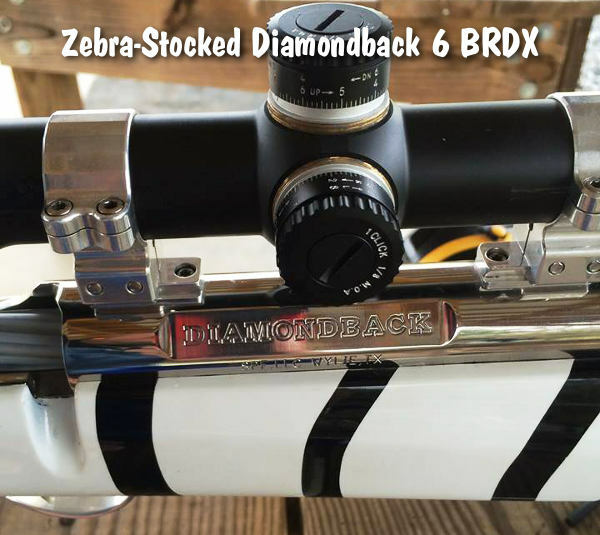 George Clay had his sleeved 700 6XC with 115gr DTACs and Bug had his Diamondback 6 BRDX and 103gr Vapor Trail bullets. Early to mid-afternoon is not the time for precision 800-yard shooting as the mirage was terrible and the wind was gusting in the high humidity and 95 temps. We took a few shots and got close but no HIT. I told Junebug to go home and load some shells and come back at 7:00 and I believed we could make it happen. After 7:00 pm is the best time to shoot as the mirage disappears and the wind goes to zero. We met again at 7:00 and had Shayne Halliburton as witness. I took a few shots then Junebug took a few zeroing shots on metal. He was not satisfied with the grouping so he switched brass. He had some new Hydro-formed brass that had never been fired. He took three sighters on the metal plate and the first two made two little black spots that were touching. Followed with a third shot that almost touched the first two. Darkness was setting in and I told Bug he better try the quarter now. Through my March scope I could barely see the bright quarter and my 1/16th dot completely covered the quarter. Junebug moved the Diamondback to the quarter and touched her off. A half second later the bright spot on the black paper was gone. I jumped up and did a dance and war hoop and the Bug jumped up for a high five. Now we hoped we could find the quarter. Luckily it jumped out in front of the backer less than five feet and Bug found it immediately. For more information (including history of the Zebra rifle), view this Shooters’ Forum Thread. Credit Boyd Allen for finding this story in our 6mmBR and 6BR Improved Sub-Forum. T-DOME photo by Forum member George. 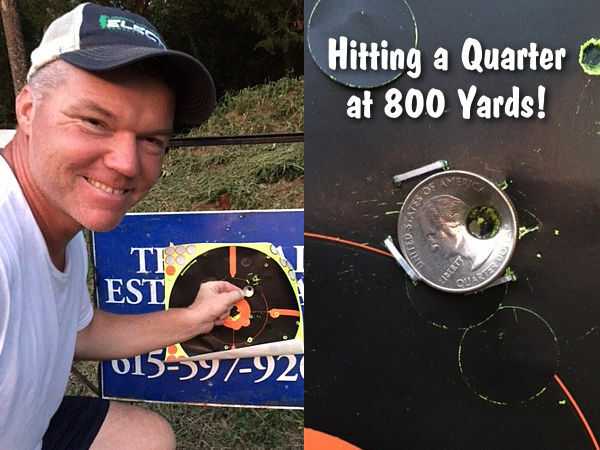 Share the post "Punching a Quarter at 800 Yards"